Protein is a vital part of any fitness regimen and if you’re in the business of making any serious muscle gains, it may be impractical to get the amount of protein you need just from your diet. After all, it's not always easy to carry around coolers filled with grilled chicken breasts and salmon everywhere you go! Protein shakes are a staple among avid gym goers and body builders because of the high amount of protein that can be consumed from a single glass or cup. However, many individuals, particularly beginners, can’t really stomach the taste of a protein shake but that’s usually because they follow the instructions on the protein powder packaging without adding any tweaks or customization to their drink. It's pretty bland just added to water. What then happens is that drinking the protein shake becomes a chore and they slowing start drinking less and less, thereby halting or limiting potential gains. Adding some flavor to your protein shake, and mixing it up from time to time is the key to your long term fitness success. This article touches on a few simple but impactful ways to make your protein shakes much more palatable on a budget. Protein shakes are often mixed with water as it's considered the healthiest option. Mixing protein shakes with milk, though, also has benefits. Not only will the shake taste better, but you'll receive a boost of additional casein (slow digesting) protein which can also help your muscles recover more quickly. The extra calcium, Vitamin D, Vitamin A, and potassium can go a long way as well. I usually prefer skim milk or unsweetened soy milk with my protein. Any type of fruit you can add to a blender will undoubtedly add taste to your protein shake. On top of that, yogurts often combine flavors on their own which can also give your protein shake some added flavor. Furthermore, yogurt will give your shake/smoothie even more protein, calcium and probiotics. Ginger can also help to ease pain from your workout, while peanut butter adds extra protein. In any case, adding these two ingredients, either by themselves or together, will certainly give your taste buds a new sensation that will make your protein shake a delicacy instead of a chore. 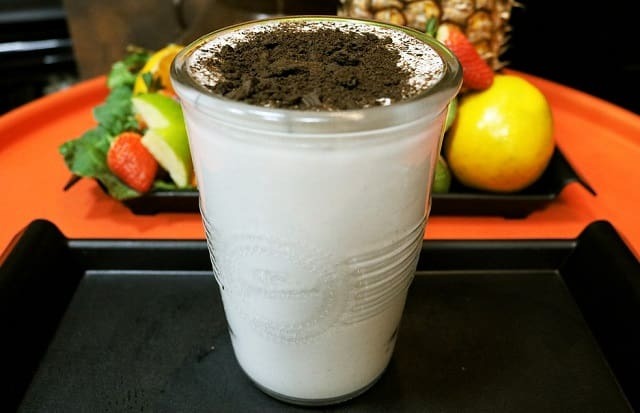 We can’t have it all, however, so the best middle ground is having your shake at a nice, chilled temperature (somewhere between room temperature and cold). You can obviously also blend a protein shake with ice cubes or add ice cubes after the fact. Cinnamon is pretty simple when it comes to easily boosting flavor without adding any additional calories. It's cheap and even has additional health benefits. Ground pumpkin spice can provide even more of a unique flavor for nearly the same price and just as easily. It's basically just cinnamon with nutmeg, ginger, and cloves. All healthy ingredients! Just don't buy the unhealthy flavored syrups instead that they use at many coffee shops and packaged products. OK this one doesn't add that much flavor, and that's the best part! While it can add a little thickness or nutty / whole grain flavor, it's a mostly flavorless way to add extra protein, heart healthy omega-3 fats, and fiber to your shake! While chocolate candies aren't usually the healthiest option for you, 100% cocoa powder is very healthy, easy, and affordable. It's definitely a little bitter but it gets sweetened with the additional ingredients in your shake. Cocoa powder has protein, heart healthy fats, antioxidants, and fiber as well. Vanilla extract is another great way to quickly and easily boost flavor. Just a single drop is enough to significantly add some flavor without adding any extra calories. Gone are the days where drinking protein shakes was like chugging cement. Enjoy your protein shakes and smoothies, no excuse! I hope you enjoyed this article about helpful healthy hacks to improve the taste of protein shakes and smoothies on a frugal budget. Interested in more articles about protein and nutrition? - When Should I Consume Protein Shakes?